So, my brother-in-law is an immigrant from Mexico, and he came up to the United States last summer to marry my sister. His waiting time for his green card, travel Visa, workers permit and Social Security card have been ridiculously long and arduous processes. So, when he came out to visit us in Chicago recently, we expected his travel problems to be difficult as well. 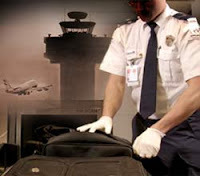 He was not able to check-in through an electronic unit, and had to endure several different processes uncommon to the typical traveler, because of his heritage and lack of typical identification. So, finally, after being uncertain whether or not they were actually going to let him on the plane, he and my sister finally sat down in their uncomfortable seats getting ready for a brief plane ride from BWI to O'Hare. As my brother-in-law reached down into his carry-on backpack to pull out his book to read on the flight, he realized that he had mistakenly packed a present he was bringing to Chicago in his carry-on bag. This present was a knife block with 4 knives in it. Oh say, can you see.